Problem: are my dynamic requirements met? During the development of a product, it is often efficient to determine the dynamic behavior of (parts of) a product already in an early phase experimentally. The results can be used as verification of, or input for models to predict the performance and to find possible improvements. For newly developed and existing products, the question is if the dynamic requirements are met and a qualification is necessary. Also, it might already be observed that the dynamic requirements are not met, e.g. under varying operation conditions, but it is not clear what causes this malfunctioning and troubleshooting is required. In these cases, an experimental vibrational analysis will be beneficial. By measuring e.g. accelerations, either induced by external forces (impact hammer, shaker) or under operational conditions, relevant information with respect to the dynamic behavior is gained, and in case improvement is needed, suggestions for solution directions can be provided based on the measurement results. 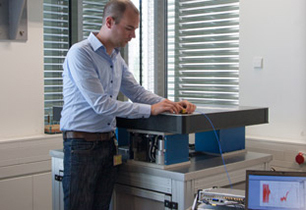 Philips Innovation Services has experienced and skilled employees, equipped with the knowledge and tools to help you with an experimental vibration analysis. Our available tools vary from accelerometers to scanning laser vibrometers. Consult you regarding your measurement setup or help perform the measurements. Perform analysis of the results and translate them to your needs (e.g. frequency response plots, modal analysis) and assess the impact of the analysis results for your product e.g. if requirements are met or not. Or you can outsource parts of your process like designing and implementing improvements where needed. By performing a Modal analysis, used to determine the Modeshapes an Eigenfrequencies and comparing these with your FEA results. By directly measuring the relevant performance variables (if possible), or by processing indirect measurements. By measuring and the correct interpretation of the Modeshapes (Modal Analysis), the critical (e.g. compliant) components can be identified and improved. By malfunctioning of a product, the right experiments (e.g. measuring acceleration levels, Frequency Response Functions or performing a Modal Analysis) will show the cause of the problem. Why a detailed FEA model is not (always) the best start of your design process. Experience learns, that it is often better to start with simple models (lumped mass) instead of an FEA model. Using models to predict dynamical behavior is very helpful when designing a product, or to improve performance. It’s tempting to create a complete and detailed (FEA) model of your product for analysis as soon as possible. However, it is often better to start with simple (lumped mass) models capturing the relevant dynamics. This reduces the computational effort, increases flexibility and leads to a better understanding of the characteristics that are truly relevant to the behavior. 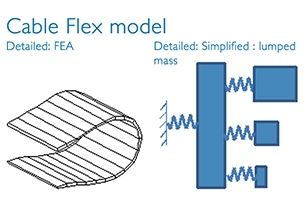 Dynamic behavior of a cable flex is complex, however, the main characteristics can be captured by a simplified model. Insight and knowledge are required to determine which parameters to use so the model that can easily be used for different purposes. The examples below give you a sample of what the mechatronic experts from Philips Innovation Services do at the High-Precision Engineering key area of expertise.